Redemptorist missionary, Father John Virgil Caskey, C.Ss.R., remembered as the very dedicated priest who stuck to his principles, died early on the morning of Sunday, May 22, 2011, at the St John Neumann Residence at Stella Maris in Timonium, MD. Father Caskey was born on August 2, 1917 and professed his first vows exactly 22 years later on August 2, 1939. He was ordained a priest on June 18, 1944 at Mount St. Alphonsus in Esopus, NY. He began his ministry as a professor at the Redemptorist seminary in North East, PA where he taught Spanish and Ancient History. However, early in his priesthood he developed serious health problems and had to receive treatments for arthritic and respiratory ailments in Tucson, AZ. These physical concerns prompted his doctors to recommend a more temperate climate. The result was a career of more than 50 years as a missionary in Puerto Rico and the Virgin Islands. In addition to his work in the Virgin Islands, Father Caskey also served for many years in Puerto Rico. Among the communities that received his dedicated ministry were Ponce, Caguas, Fajardo, Aguas Buenas, and Guayama. Rev. 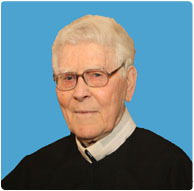 John Virgil Caskey, C.Ss.R. Wake service beginning at 7 p.m.